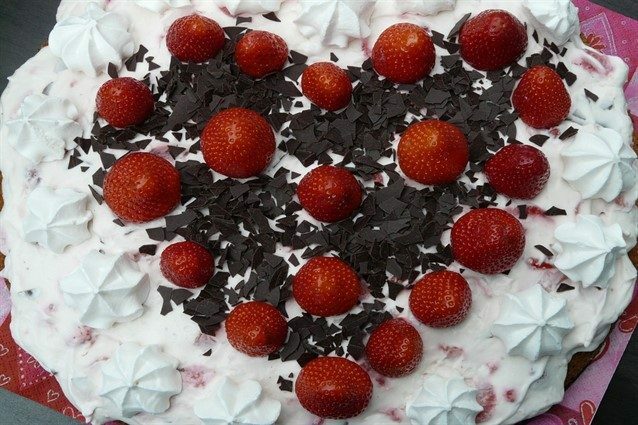 The heart-shaped cake is a simple chocolate dessert, very gluttonous, that can also be filled with mascarpone cheese and hazelnut cream or with fruit cream, and it can be decorated with sugar paste or with colored cream. It can be a very nice idea for Valentine's Day, or for an anniversary. Just get a heart-shaped baking tray. Put the butter, softened at room temperature, in a bowl and work it with a whisk; then add slowly 100grams of sugar. Blend the remaining sugar with the egg yolks. Add the two mixtures to the flour (to be added little by little), and to the egg whites whipped with a pinch of salt. Then, add baking powder and vanillin. Divide the mixture and add cocoa powder. Grease and flour a cake pan and spread the mixture inside alternating the two mixtures, obtaining a “imperfect” chessboard. Bake it in a preheated oven for 40 minutes at a temperature of 160 degrees and then at 180 degrees for other 15 minutes. Let the cake cool and place it on a tray. Garnish it with small flakes of cream and small hearts of sugar and serve it. You can also create a royal icing and decorate it with small devils and roses, and sugar and chocolate writings. 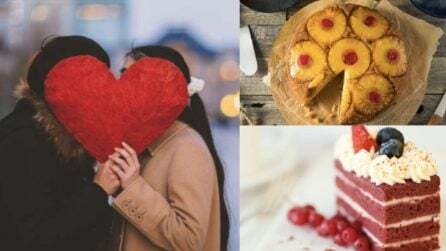 Just remember that the heart-shaped cake dough should be like that of a yogurt cake and it can also be made on several levels, without eggs and without the mold. A heart-shaped cake can be decorated with chocolate glaze or with sugar paste. Let's see how to do it in the second case. Let’s prepare the sugar paste and, for the occasion, we can make it red. Then let’s take the dough and divide it and color it with the powdered food colorings. Then put the sugar paste into food bags and just continue to build the base. We must add the strawberries cream but first we need to wet the sponge cake on both sides. Wet your cake with a vanilla syrup, then take one of the sugar paste sticks and spread it thinly. The outer part of the heart should be covered with strawberry jam that will act as an adhesive.